Again, running enthusiasts and Active Directory specialists ofFirstAttribute AG met in Frankfurt to participate with 70,000runners at the JP Morgan CC in Frankfurt. The “Chase Corporate Challenge” started on June 17, 2015 at 7.30pm. FirstAttribute AD Consultants with the slogan “IT Projekteauf Kurs” (IT projects on track) on their orange shirts joinedthe challenge with a delay of 10 minutes due the big number ofparticipants. 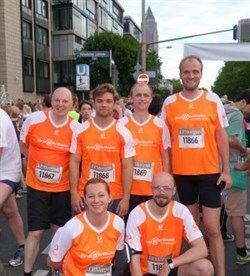 With team spirit and fairness in the middle, ourcolleagues ran the 5,6 kilometer track downtown Frankfurt. At the biggest company runnning in the world our AD Consultantscould even improve their fast running times of the last year. Every year, migration specialists ofFirstAttribute AG participate in various company runnings. Our consultants and technicans are currently running AD projectsfor various companies in the Rhein-Main area. Customers inFrankfurt are mainly large companies inbanking, services andindustry.